More than 10 million young Africans enter the workforce each year, and most of them work in agriculture. The time to transform the sector has arrived. We spoke with CTA Director Michael Hailu, who has been leading the organisation in a strategic orientation towards youth, most recently at the Young Africa Works Summit in Kigali. CTA’s Strategic Plan 2016–2020 includes a youth strategy, but more than that, youth are really central to the whole Strategic Plan. How did this happen? We have had this focus for quite some time, and in the last several years it has been expressed as a cross-cutting focus on youth and women. It’s becoming ever more important globally; people are talking about these big challenges of unemployment and migration, and the youth issue is central to addressing these bigger problems. So yes, I would say that it continues to be very important, only now it’s about how we are mainstreaming and how we are scaling up the work around youth, especially youth engagement in agricultural value chains. When I talk about “agricultural” value chains here, I’m talking about a broader view of the whole agri-food system: not only farming but also value addition, the non-farm agri-food sector, all of the employment opportunities in that – there is a whole system we should be looking at. Is there a connection between that change in perspective, looking at the whole agri-food system, and involving youth? Do you see roles for young people to be involved throughout that whole food system? Absolutely – but of course the situation varies from country to country. One recent study by MasterCard Foundation looked at youth engagement in agriculture in Nigeria, Rwanda and Tanzania. In Nigeria a lot of opportunities are actually on-farm for young people, while in Rwanda they are more often off-farm, and in Tanzania they are off-farm, but still very much in the agri-food systems, such as in processing. But clearly, as economies transform in Africa, we see a lot more off-farm employment in the agri-food sector and also outside it. The key message is that any way you look at it, agriculture will continue to be central for at least the next decade in terms of providing employment for young people. 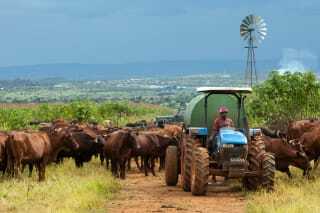 If we are trying to address employment challenges for them, agriculture is still the heart of the matter. A lot of studies now are also looking at how urban and rural areas connect. Many people live in this space between urban and rural, these small towns, which offer a lot of opportunities, but they tend to be quite neglected in development policy and also government policy – a lot more focus is still on cities. But in fact, these smaller towns offer really great opportunities for young people, who can stay near the rural areas but have the facilities that you get in towns. So we are putting a lot of emphasis on creating opportunities in these towns between the urban and rural spaces. It sounds like a lot of that opportunity means organising by young people, and of young people, into organisations, groups and value chains. Is that where the starting point is, bringing people together? In fact, there are a number of issues we look at before we even reach that point. If you ask young people, even in rural areas, what they want to do, maybe 80–90% will tell you they don’t want to be in agriculture. They want to go to cities, they want to have other jobs. I think it’s firstly important to change the narrative around agriculture, to talk about the opportunities in the agri-food sector. Agriculture is not just hard labour that pays very little, but taking the agri-food sector as a whole, it is an opportunity for engaging young people in business. So the whole issue of awareness among young people, and also the need to promote support in and around policy circles, is the first issue. The second issue is skills development. You really need to invest a lot of energy in providing skills for young people, especially entrepreneurial skills. Young people are better educated than in the past, but they are still not well prepared for the business sector. Many studies show that when the private sector try to hire young people they find it difficult to find the right skills. So we have been working with some of the African agribusiness schools to train young people in business. Once you do have a group of young Africans who have a good plan, and business skills, and are interested in going into agri-business, what are the big immediate challenges they are likely to face? One of the key problems is access to finance. Young people usually don’t have collateral: they don’t have land or machinery. Generally, banks are reluctant to lend money to agriculture, but it’s even worse for young people. Now one of the things we are trying to do is to help young farmers to build their credit-worthiness using information and communication technology (ICT). We are working with some of the local ICT companies we have helped to nurture, who are in turn helping small farmers to keep better farm records. If small farmers keep a good farm record of how much they are producing, how much they are selling, and so on, they can use those records to go to banks and apply for credit. We have been working with one company in Kenya, FarmDrive, one of the startup companies that we helped to develop. With CTA’s support they have trained over 500 farmers on record keeping and reached out to a further 3,000 young farmers with awareness raising. There is also in Africa a huge amount of energy among young scientists and agricultural researchers, including many who are involved with CTA itself. CTA has a lot of young energy on the research side. How do you think that can be leveraged? We have worked for many years to identify young scientists, especially young women scientists, through competitions. We use these to identify highly talented young women scientists and support their work to focus on the real challenges that farmers face in African agriculture. For example, Jemanesh Kefetew, an Ethiopian agricultural scientist, won the first prize for Young Professionals in Science competition for her work in identifying traits that produce resistance to stem rust in durum wheat. Ameenah Gurib-Fakim, a prominent biodiversity scientist and current President of Mauritius, is one of the former mentors and role models of this programme. So the innovation potential of the science is what you are looking for? And is scaling up those innovations challenging, when working with lots of different groups of young people in different countries? It is always a challenge to scale up. But in the area of ICT, for instance, one of the things we are doing is to engage young ICT professionals through a hackathon to develop smart ICT solutions for an agricultural problem (e.g. helping smallholders to access credit). The winners are given mentoring support over a period of six months in business skills and so on which allows them to grow their business and attract investors and donors. One of these companies we helped in Uganda has developed an app, MOBIS, that makes it easier for smallholders to access credit through savings and credit cooperative organisations. Their target is to reach 400,000 farmers in the next few years. So far they have reached around 30,000. That kind of scaling up can really only happen through private investment. We can help these young people turn their ideas into promising businesses, and that is the only way we can achieve large-scale adoption of innovations. In your recent visits, what new idea or innovation has really surprised you? What I find special is how young people are leveraging technology to serve farmers and connect them to markets. I am inspired by one project we are collaborating within Senegal, Sooretul, a woman-run business helping women farmers access lucrative markets using a digital platform. The platform allows farmers to aggregate and present their products to the urban market online, including the Senegalese diaspora community, I like the whole idea of really leveraging ICTs to help farmers, not only to give access to services, credit, weather information and so on, but also to open up market opportunities. That is a high level of ambition, as well, to be connecting small farmers with potentially international markets. That seems like a common theme with these projects, that they aim quite high, and maybe that is part of the spirit of African youth. People have to aim high, and especially young innovators. They have a lot of ideas and see opportunities in the global marketplace. However, I’m not saying it is just the international market that offers opportunities because in fact, the major market opportunity for smallholder producers is the local and regional African market. In particular, fast-growing African cities, with rapidly growing middle class with more appetite for processed foods, meats and fresh vegetables. ICTs can help connect urban consumers with smallholder producers, including women and young farmers. This way agriculture could become an attractive sector for talented young people who can make an important contribution in transforming African agriculture into a profitable and sustainable business. Read the book Youth and Agriculture: Key Challenges and Concrete Solutions, published by CTA, the Food and Agriculture Organization of the United Nations and the International Fund for Agricultural Development. Catch the latest CTA news stories on youth. Follow @MHailu and @CTAflash on Twitter for regular updates. Connect with CTA on Facebook. Subscribe to the CTA Flash newsletter.